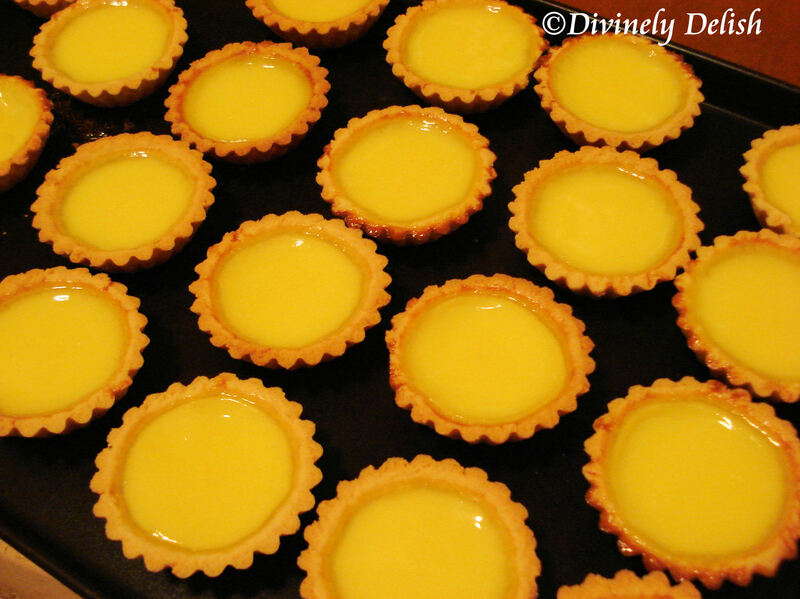 Whether you’ve been to Hong Kong, gone for Dim Sum in a local Chinese restaurant or visited one of the bakeries in Chinatown, chances are you’ve seen or tasted these Egg Tarts (“dan tat” in Cantonese). 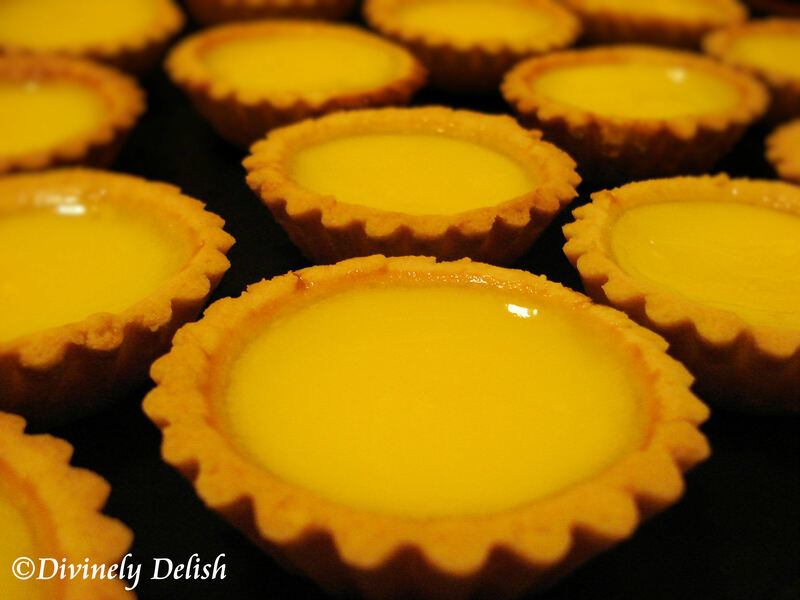 Given the history of Hong Kong, it is likely they were adapted from English custard tarts. Or, quite possibly, it was the Portuguese influence from nearby Macau, with their Pastéis de Nata (Portuguese Egg Tarts), which, I should add, are also very popular in Hong Kong and other parts of Asia. Despite their probable European roots, Egg Tarts have become the quintessential Cantonese pastry. With their flaky crust and creamy, lightly sweetened egg custard filling (imagine – freshly baked and served warm), I can see why these little tarts are loved by so many. They were actually number 16 on CNNGo’s List of the 50 Most Delicious foods in the world! Now, I must admit that although I’ve eaten egg tarts on many occasions, I’ve never been crazy about them. I’ve never bought them and I most certainly never tried making them at home. Anyway, I always thought they would be way too complicated to make. That is, until my parents visited me recently and my Dad, who LOVES Egg Tarts, asked me to make some for him. I found a great recipe from Christine’s Recipes, which includes step-by-step instructions with photos (which, unfortunately, I don’t have here). The Egg Tarts were delicious and I even had a few! My parents thought they tasted authentic too. My dad however, preferred a flakier crust. From what I’ve read, it seems Egg Tarts are made with two different crusts – a shortcrust pastry with a cookie/shortbread-like texture (featured in this recipe) and puff pastry which gives the flaky layers. I guess it’s just a matter of preference. I should also add that since I didn’t have evaporated milk on hand when I made these, I used homogenized (3.25%) milk instead and they turned out great. But if you prefer a richer, creamier taste, stick to the recipe. Now that I know how surprisingly easy it is to make Egg Tarts, I will surely be making them for friends and family. In fact, I’m planning to visit my parents next week and I already know what I’ll be bringing along! 1) Place butter at room temperature until softened. Cream the butter and sugar with an electric mixer over medium speed until the mixture is smooth, fluffy and light in color. 2) Add in whisked egg, half at a time, beat over low speed. Add vanilla extract, mix well. 3) Sift in flour in two batches, scraping down the sides of the bowl between additions with a spatula, and making sure all ingredients are well combined. Knead into dough. 4) Roll out the dough to a 1/4″ thickness. Cut dough with a cookie cutter that is slightly smaller than the size of your tart tin. Line each tart tin with a circle of dough, lightly pressing the dough with your thumbs, starting from the bottom then around the sides. While pressing the dough, turn the tart tin clockwise/anti-clockwise in order to make an even tart shell. Trim away any excess dough. 1) In a bowl, dissolve sugar in the hot water. 2) In another bowl, whisk egg with evaporated milk. Pour into sugar water mixture. Mix well. 3) Pour egg mixture through a sieve into a bowl or container with a spout (to remove any clumps). Pour strained mixture into tart shells. 1) Preheat oven to 200C (392F). Position rack in lower third of oven. Bake tarts for 10 to 15 minutes until the edges are lightly browned. 2) Lower the heat to 180C (356F). Keep an eye on them. Once you see the custard puffing up a little, pull the oven door open about 2 to 3 inches (to prevent them puffing up too much and then collapsing when cooled). Bake for another 10 to 15 minutes until the custard is cooked through. Just insert a toothpick into the custard. If it stands on its own, it’s done. Yes – can’t wait to make them again!